The hurricane missed the east coast but something big blew in at the hands of Capt. Taylor Sears. Winds pushed 50 on the mainland as Hurricane Bill passed Cape Cod, and that was far enough away to not affect fishing. 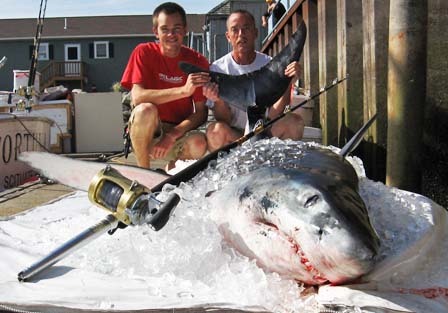 Sears took advantage several days later, landing a huge mako shark while tuna fishing. Sears, of Mass Bay Guides in Scituate, Mass., successfully caught a 624-pound mako shark, which would have been a record for male makos had it not been harpooned. Sears and mate Capt. Tom King met their paying fare at 5 a.m. Thursday and steamed toward Provincetown, Mass., in hopes of rounding the Cape to their tuna grounds. Fifteen miles into their 18-mile journey, the port oil pump went down. Sears' only remedy was to add oil every few hours. The crew then decided to set up on Stellwagen Bank, a popular tuna ground. Sears deployed several rods, including one outfitted with a Kite and tipped with a menhaden moss bunker baitfish, referred to in New England as a pogy. Kite fishing is gaining popularity here as the kite enables an angler to dangle live bait at the water's surface, tantalizing gamefish lurking below. This kite rod took its first tuna strike, and the father of the charter was first on the fish. After a 45-minute battle, an estimated 65-inch bluefin tuna weighing roughly 170 pounds popped to the surface with a big mako shark chomping on it. "I yelled like a little girl," Sears said, "Yelling mako! Mako!"